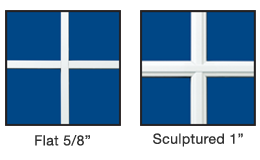 Champion windows and doors can be fabricated to your specific construction and architectural requirements. We have developed our windows and patio doors to be quickly and easily installed. This not only gives you improved productivity on the job, the quality and structural integrity of our products will result in fewer customer call backs. 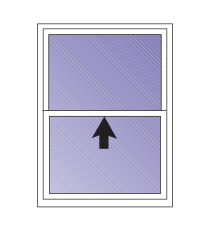 A single hung window opens from the bottom upwards. 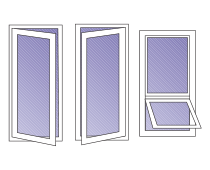 Single hung windows are comprised of five major components: main frame, vent frame, two IG units (Insulated Glass Unit) and a set of balancers. All single hung windows can have any shape as shown below. The fixed window is the simplest type. It consists of only two main components. The frame and an IG unit. It is also known as an O-panel and a picture window. Fixed windows can be made in to any architectural shape. 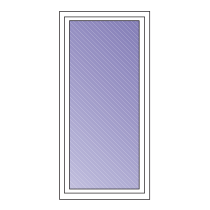 A horizontal sliding window has a fixed portion of glass referred to as an “O panel” and has at least one operable panel called an “X panel” or “vent”. A horizontal slider is comprised of a main frame, a vent frame, a sill track and at least two IG units. The venting portion moves side-to-side to allow ventilation. Operable windows are equipped with a removable screen. The moving panel rolls on an elevated monorail track using an industry leading adjustable roller system. 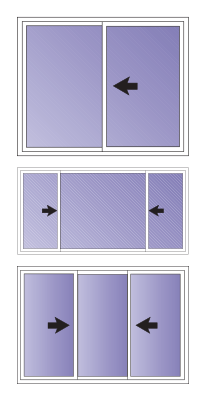 There are three sub sets of horizontal sliding windows. In the industry two paneled windows are referred to as either an XO or an OX depending upon the side of the window that opens. X always refers to the portion of the window that moves and O always refers to a glass portion of a window that does not move. The windows open from left to right on the outside looking in. Horizontal sliders can also be configured as an XOX. On an XOX both sides open and there is a fixed panel in the middle. The standard configuration is a vent ¼ of the width, a fixed ½ of the width and another vent ¼ of the width. Another configuration is three equal panels of ⅓ the width. Hinged windows are broken down in to two main categories: casements and awnings. All hinged windows are made up of three main components, a main frame, a vent fame and an IG unit. Casements are windows that are hinged on either the left or the right. The swing direction is described from the outside looking in. For example, when standing outside of a building, if the hinges are on the left hand side, the casement is referred to as right casement. Awnings are windows that have hinges at the top and swing out.